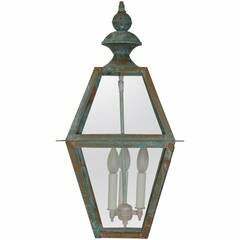 This lantern has Mediterranean style precedence with historic profiles and contemporized geometric lines. A striking fixture during the day but even more so at night when the patterned hem casts intricate shadows. 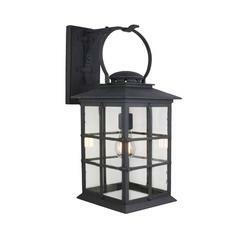 Our De La Guerra 04 lantern finished in our DLG Grey finish has Mediterranean style precedence with historic profiles and contemporized geometric lines. A striking fixture during the day but even more so at night when the patterned hem casts intricate shadows. 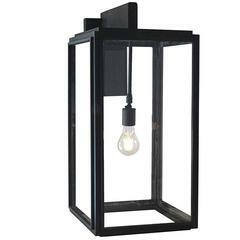 All lanterns go through a metalizing process, a protective zinc layer added to ensure protection and durability against corrosion and harsh weather conditions. Max wattage: 60, one standard socket. 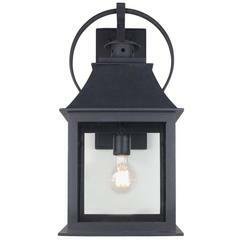 Large Arm Mount Shown: 8.75"W x 12"D x 19"H Backplate: 5"W x 9"H Hand-forged in heavy gauge wrought iron. ETL listed. All lights ship with 5W LED Edison dimmable filament bulb. Lead time will increase if more than ten lights are ordered. 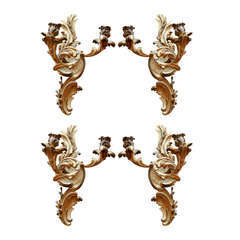 Set of four French gilt bronze scrolled three-arm sconces with floral motif. 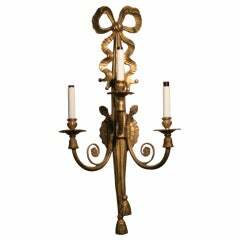 Originally candle powered and have been electrified. Early 19th Century. 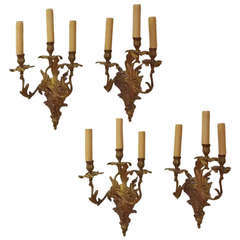 Group of 4 19th c. French Fine Dore Bronze 2 Arm Sconces. They are not electrified.